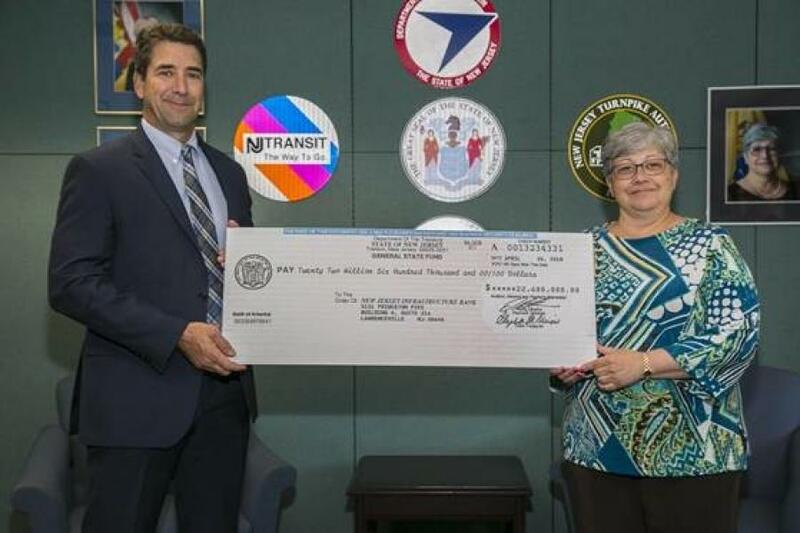 NJDOT Commissioner Diane Gutierrez-Scaccetti presents the I-Bank Vice-Chairman, Robert Briant Jr. with a $22.6 million check from the State Local Aid Infrastructure Fund, marking the launch of the New Jersey Transportation Bank. The Murphy Administration recently announced that the New Jersey Transportation Infrastructure Bank is now offering low interest loans to municipalities and counties to reduce the overall cost of local transportation projects. New Jersey's first transportation loan program, the Transportation Infrastructure Bank (NJTIB) is a partnership between the New Jersey Department of Transportation (NJDOT) and the New Jersey Infrastructure Bank (I-Bank). The NJTIB provides low interest loans for municipal and county transportation projects. Modeled after the successful NJ Water Bank (formerly, the New Jersey Environmental Infrastructure Financing Program) and the NJDOT's Local Aid Program, the Transportation Bank was established as part of the Transportation Trust Fund renewal to provide low interest loans for local transportation projects. To get started, NJDOT's Local Aid Infrastructure Fund is providing the NJTIB with $22.6 million generated from the gas tax increase. Interest rates in fiscal year 2019 are anticipated to be between 1.5 percent and 1.75 percent for terms of up to 31 years. Loan applications are available at www.njib.gov. For NJDOT news follow the agency on Twitter @NJDOT_info and on the NJDOT Facebook page.